I was able to find a lot of new spring/summer waxes this week, so I have new things to try! This was an interesting week in wax though, with new stuff there is always room for error and surprises. Every week I melt new waxes to try, but I also often melt waxes I love that I have already reviewed. 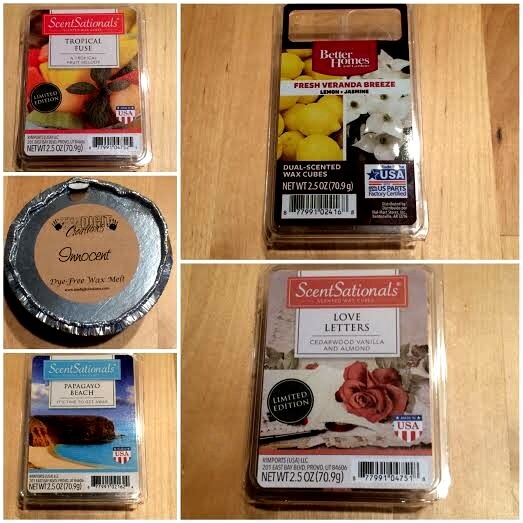 In an effort to make things easier on here and so many of my favorite waxes don't get forgotten, I'm going to list under my main review my "Re-melts of the Week". I'm going to list the waxes I melted this week that I've already reviewed along with a link to my original review. Let's get started with this week's newbies! My Thoughts: There are a lot of tropical fruit mixes out there in wax. This one is different than others I've tried. It's hard to describe, but it's a blend of perhaps passion fruit, kiwi, a bit of floral, and some green notes. This is more of a fresh,clean, floral/fruity scent than a straight up fruity scent. It kind of smells like fancy body wash from Korres. It's a beautiful scent that I really love, but I didn't find it had a strong throw nor did the scent last very long. This could of been a star, but it fell flat when it comes to strength. My Thoughts: This one of the duo packs where there is the lemon scent on one side of the package and the jasmine scent on the other side and you blend them together. The lemon side on here is a very strong tart lemon and the jasmine is a very soft floral scent. I liked the combo of these as they both were very natural and fresh smelling. I do think the lemon is overpowering the jasmine here, and I wish it were more of a balance. This had a strong throw that lasted several hours. My Thoughts: This is supposed to be dupe to Lush's Celebrate. I haven't smelled that so I can't compare, but I do adore this scent. This has an amazing citrusy fresh note paired with a clean soapy note. I find this scent to be very feminine and soft also. It's hard to describe, but it's a definite fancy bath & body product type scent. This had a strong throw that lasted several hours. My Thoughts: This has all the notes of the type of scent I hate, woodsy, sweet, and foodie. I was drawn to this scent though because it smells like new book smell. The whole "letter" part of this scent name is accurate. It smells like paper. This is like Barnes & Noble in a bottle. That being said, I liked this for a few hours, but those woodsy and sweet smells started to tire on me quickly. Many people love woodsy scents with vanilla in them, so I think this would a popular one. I can only do these scents in small doses. It had a great throw. My Thoughts: What kind of non-scent description is that? Worthless! This is a strange one. It smells nothing like you'd expect it to based on the packaging and the name. There is nothing beachy about this in the least. This smells like a cranberry martini. It's a tart cranberry smell paired with wine/alcohol type scent. This is holiday scent to me. I don't hate it or dislike it, it's just the type of scent I want this time of year, and it's package full of lies. I wanted a beachy/fresh scent and I got Christmas cheer.